ALOHA and E Komo Mai! Aloha is not only hello and goodbye, but also a way of life practiced on the Hawaiian isles combining love, compassion, peace, and affection. You truly feel the spirit of Aloha from the first moment you step into Disney’s slice of paradise at Aulani - a Disney Resort and Spa. This was our first visit to the Hawaiian islands. Matt and I were celebrating our 20th Wedding Anniversary and wanted a destination that had a mix of family-friendly togetherness and opportunities to escape for a little adult time. Aulani is the perfect place for both, and I can now see why it’s a favorite destination for adults, families and multi-generational group travel. The Aulani family warmly welcomes everyone, women receive a fragrant floral lei, men are adorned with a masculine kukui nut lei and kids receive a Menehunu necklace (more about those mischievous little creatures later). Our awesome friends gave us a family photography session as an anniversary gift. We highly recommend scheduling a session with Marella of Marella Photography! Her beautiful photographs preserved our Hawaiian experience for generations to come. Okay - let’s get started! Here’s everything you need to know about the Aulani Resort. Aulani is located on the beautiful island of Oahu, Hawaii. Close to the Daniel K. Inouye International Airport in Honolulu, the Aulani Resort is easily accessible from the airport by car or shuttle. Even though Aulani is located near the hustle and bustle of Honolulu, it feels hundreds of miles away, nestled among the palms in the quiet beach-front, golf course community of Ko Olina. The airport arrival is pretty uneventful. Follow signs to baggage claim, grab your gear and let’s hit the road! This is probably the hardest decision you will have to make during your Aulani vacation. Car or no car. That is the question. The dilemma is one of convenience versus cost. We will give you the pros and cons, but the final decision will depend on your travel personality. The ultimate freedom in transportation is renting a car at the airport for your entire stay, and it’s a good idea if you are planning multiple“off-property” excursions. In my book, one of the main benefits of having a vehicle from the aiport is that you can stop at Costco and Target and stock up on groceries and snacks to supplement your Aulani dining. You can also take advantage of some amazing “non-Disney” experiences. There is an Alamo car rental agency located on property at Aulani and is a good option if you only want to rent a vehicle for a day or two. You might pay a bit more per day than at the airport, but you won’t be saddled with the nightly parking fee. Want to see more of the island but really don’t want the hassle of renting transportation? Aulani offers excursions that include transportation for those looking for a driving-free vacation. Check out this extensive list of excursions offered by Aulani. If you choose not to rent a car, the cost to shuttle from the Airport to Aulani with Hele Hele Shuttle, the exclusive shuttle service for Aulani. Rates at the time of this posting are approximately $24 a person. Shuttle service can be booked by calling(866) 443-4763 between the hours of 7:00 AM and 9:00 PM PST. You may also call (808) 427-1500 or dial ext. 6798 while at the Aulani Resort, between the hours of 6:00 AM and 9:00 PM HST. Not a DVC member? We’re sorry to say you will pay a premium to park at Aulani. As of this writing, Aulani’s nightly parking rate was $37. But just think of all the money you save on a weekly car rental and try not to dwell on the parking premium. If arriving early or departing later in the day - have no fear - you can still take full advantage of the Resort and play in the water all day. Aulani provides a beautiful complimentary Luana Lounge that has showers, restroom, dressing room and lounge with TV. Speak with a front desk agent for more in formation on how to access the Lounge and make the most of your travel days. Aulani was born from an inspiring collaboration between Walt Disney Imagineers and local Hawaiian artisans and experts. My first impression was that I had entered a true island resort, with a hint of Disney. Aulani celebrates the natural wonders and rich traditions of Hawaii without an overpowering Disney theme park feel. We couldn’t have been more pleased with the resort itself. With over 800 rooms, you could use some help selecting the type of room that is best for your visit. First, start with Disney’s room comparison tool to determine which room and price level are best for your crew. Second, visit Disboard’s Room Finder. Using this tool, we booked an Island Garden View price with touch of ocean! We stayed in room 1571 which is a DVC 1 bedroom island view room. See that slice of ocean view? That was just enough for us. Of course, Aulani can’t guarantee you will receive a specifically requested room, but they do try very hard to honor all requests. Not a DVC member? Did you know you can rent DVC points and take advantage of all the Vacation Club perks? Check out our favorite DVC rental options at David’s DVC Rentals. If your plan is to plant your family flag on the beach and not move, then Aulani has you covered with pristine beaches and calm tidal pools. Does your crew crave a bit of adventure? Then you simply must take advantage of all the wonderful activities Aulani has to offer, which are too numerous to even list! Check out the latest list of Aulani activities. Waikolohe Valley pool area is positioned between the residential 2 towers and offers an aquatic option for everyone. Did you know Aulani Resort pools are heated for year-round enjoyment? And all locations are included with your resort room reservation. Ka Maka Grotto - a peaceful infinity edge family pool. Waikolohe Pool - family friendly with high-energy pool parties throughout the day. Waikolohe Stream - tubing adventures in 2 speeds: rapids or lazy! Our family loved the Waikolohe Stream. The double raft is great for the young ones that may be a little nervous going down the awesome thrilling slide!! You’ll love floating down the lazy river while all your cares drift away. The idyllic seascape at Aulani’s lagoon will ease your cares away. Disney carefully maintains this natural lagoon to prevent large waves and rip tides, making it the perfect beach escape for families. Beach chairs, umbrellas, boogy boards, life jackets, and sand toys are complimentary. Snorkel and paddleboards are an additional cost and all are available at the Beach Rental shack. There are a handful of options for dining at the resort. In our opinion, this is the one and only downfall of Disney’s Aulani, forcing guests to go off property if they want a little more variety in their meal choices. Makahiki - The Bounty of the Islands. There are a few tasty places within walking distance. Monkey Pod - we loved this place. Local fresh food. Even the ketchup is made in house. Pizza Corner - yes. This was first place we ate as soon as we landed in Hawaii. What can I say? We are pizza people. The garlic knots are are to die for. You can thank me later. Roy’s is a nice Hawaiian inspired menu across street from Aulani. ABC Stores island Country Market is a convienence store / deli / liquor store/ souvenir shop all in one. A great place to shop for all your needs and conveniently right across the street from Aulani. If you are driving and have access to a kitchen, pick up groceries at Costco and/or Target on the way to the resort. We recommend purchasing some food if you are staying a week or more as there are only 2 table service restaurants in Aulani. There are a few places to eat across the street, but we did end up wanting to make some of our own food for a few meals. IS AULANI RIGHT FOR ME? You may be wondering if an Aulani vacation is right for you. Maybe you have toddlers or are wondering if there would be enough to keep your moody teen engaged? We gathered info for each type of crew and included it below. Remember - Disney has over 50 years of experience entertaining all types. You can rest assured Aulani has what it takes to pull off a great family vacation. Menehune Bridge. According to tradition, the Menehune are master builders, capable of mighty feats of construction overnight. And with Menehune Bridge, they’ve created a special water play area just for younger children. Aunty’s Beach House(3-12) free. Aunty’s fills up quick. So you can either stand in the line of jet-lagged parents early in the morning or pre-register here on Aulani’s site. Menehune Adventure Trail Scavenger Hunt. 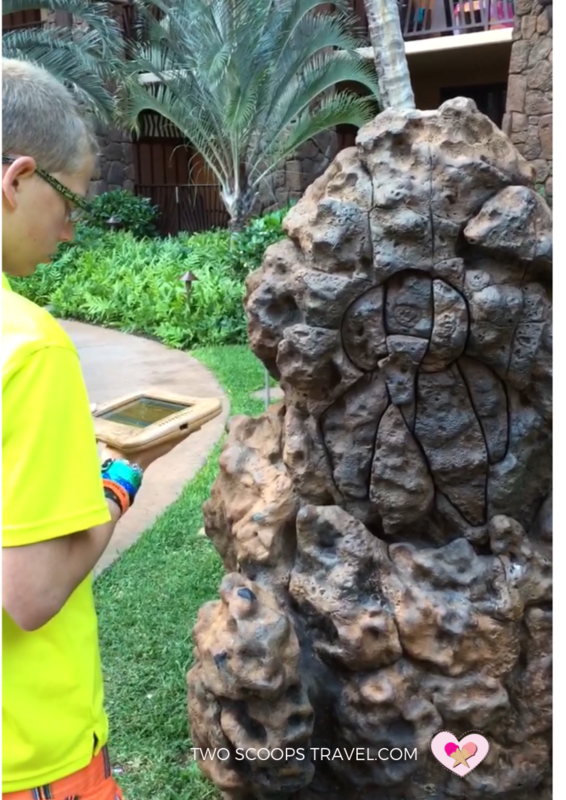 Searching for the Menehune is a like looking for those Hidden Mickeys. Teen Group. Check out Aunty’s Teen Beach House. Aulani’s not just for kids! Adults can experience their own private paradise throughout Aulani at several bars, the rejuvenating Laniwai Spa, a state-of-the-art fitness facility, peaceful whirlpools, and quiet adult-only pools. As I said, we celebrated our 20th Anniversary at Aulani. We started our evening by dropping the kids off at Aunty's - Aulani’s interactive kids club. I doubt the kids even knew we were gone! We then walked over to our spa appointment at Laniwai Spa. This is the best spa we have ever been too. It’s more than just a place for a massage. You can spend hours relaxing in Kula Wai - the outdoor hydrotherapy garden. And guess what, this area is complimentary if you purchase a full service spa treatment to enjoy before and after your treatment. To end the night, we enjoyed a delicious dinner at Ama Ama. We reserved a table before our arrival and let them know we were celebrating our anniversary. We were seated at a table in the front overlooking the ocean and just in time to see the sunset. What a beautiful island night! If you’re looking for some fantastic character meet n greets, Aulani is your place! No lines make Aulani a great choice to meet your favorite Disney characters. You can enjoy the same perks as at any WDW resort, including fabulous buffets and pools, authentic pin trading, and the flawless Disney service you’ve come to expect. With an abundance of Disney shopping and Mickey shaped food - we might never leave! Click here to see all the characters you can visit. The Resort is not overly Disney. Hawaiian island culture is featured with Disney’s impeccable service. The award-winning spa and pools make it a destination resort. Use it as a 4-star home base to explore the island of Oahu. Having spent many a vacation at Walt Disney World in Orlando, I think I expected Aulani to be just like one of the WDW resort hotels. Why should I go all the way to Hawaii when I could just stay at the Polynesian Resort near Magic Kingdom? Well, I’m so glad we made the trip. I was pleasantly surprised by Aulani’s open-air lobby and nod to true Hawaiian culture without being overly Disney. I also was impressed by the number of room options available at Aulani. Every family size and shape can find a good fit here. The grounds of Aulani are impeccable and beautiful, as you would expect from a Disney resort. I loved learning about the Hawaiian culture and enjoying the craftsmanship of local island artisans. With an abundance of activities, you may never leave Aulani. But there are so many wonderful things to do on the island of Oahu, we recommend getting out for a day or two and exploring the island. Check back to read about our favorite Oahu discoveries. If you’re considering a visit to Aulani or Oahu, let us know! We’d be happy to help you plan your Best Vacation Ever. Jump over to our Aulani page and check out the latest offers and specials. May the peace of the islands be with you!